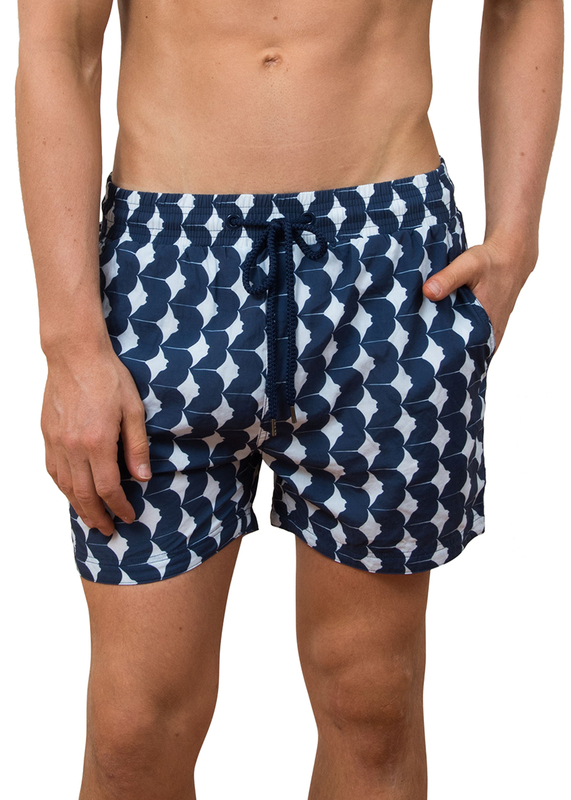 The exclusive short-run tiddler print features a tight repeat of small pale blue fish with a touch of red swimming in opposite directions. Our shorts feature a waterproof wallet which slips into your back-zip pocket and will keep your phone and keys dry while you get wet, tested to 18.2m. 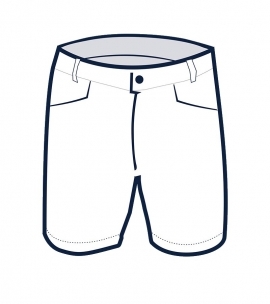 Our shorts come packed in their own carry bag for easy packing. 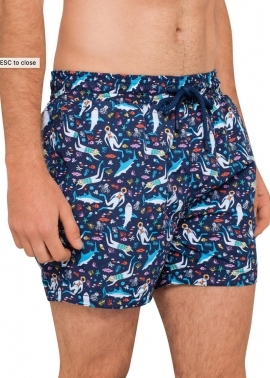 We are proud to donate 100% of the profits from these shorts to saving our Reef, in partnership with the Australian Marine Conservation Society. 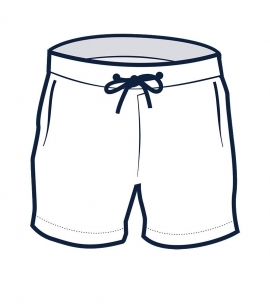 Our Balmoral men’s swim shorts are a summer classic and our most popular style. Tailored for comfort and performance, the wide leg fit and elasticated waistband make this style easy to fit most body shapes. 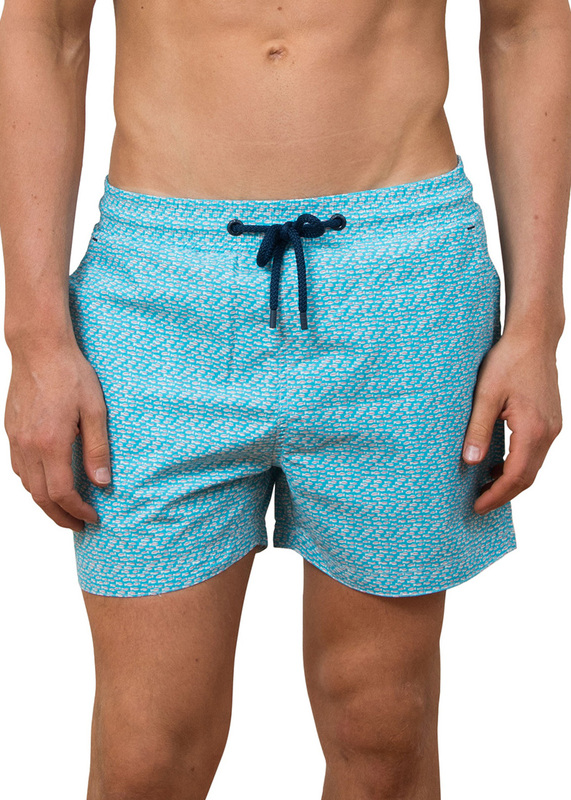 Made from Italian yarn which is recycled drift nets salvaged from our oceans, the fabric is soft, strong and quick drying and the shorts feature a mesh liner for added support. The short-run fish tiddler print is inpired by our Great Barrier Reef. Our shorts feature a waterproof wallet which slips into your back-zip pocket and will keep your phone and keys dry while you get wet, tested to 18.2m. 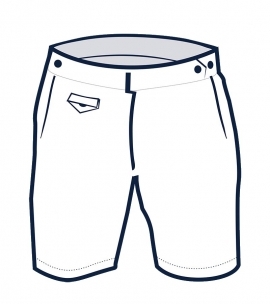 Our shorts come packed in their own carry bag for easy packing. 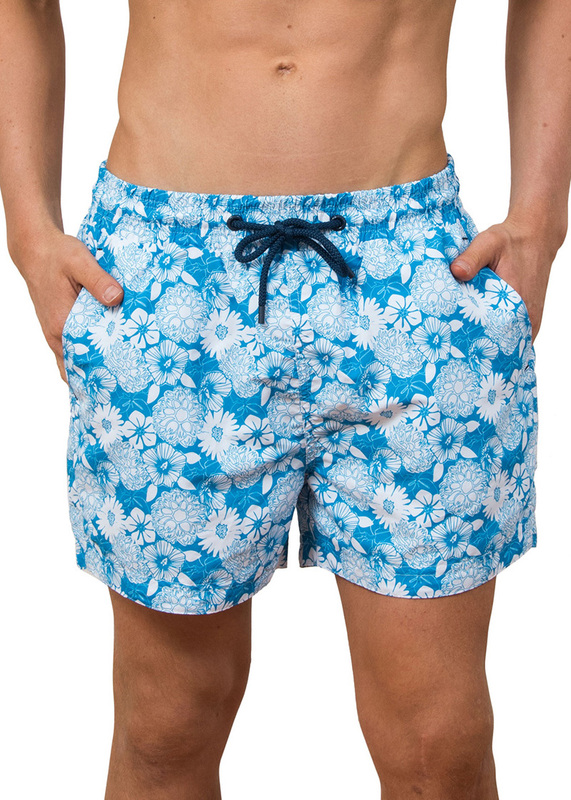 Our mens board shorts are a summer classic and Balmoral is our most popular style. Tailored for comfort and performance, the wide leg fit and elasticated waistband make this style easy to fit most body shapes. Made from Italian yarn which is recycled drift nets salvaged from our oceans, the fabric is soft, strong and quick drying and the shorts feature mesh for added support. 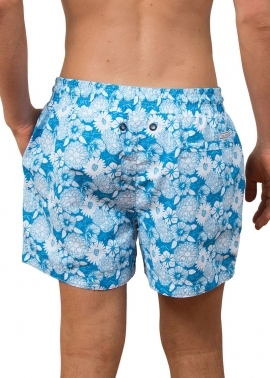 The floral print is a soft, washed out blue with a fresh white floral print, a classic colour combination that is easy to pair back with any shirts or tees. 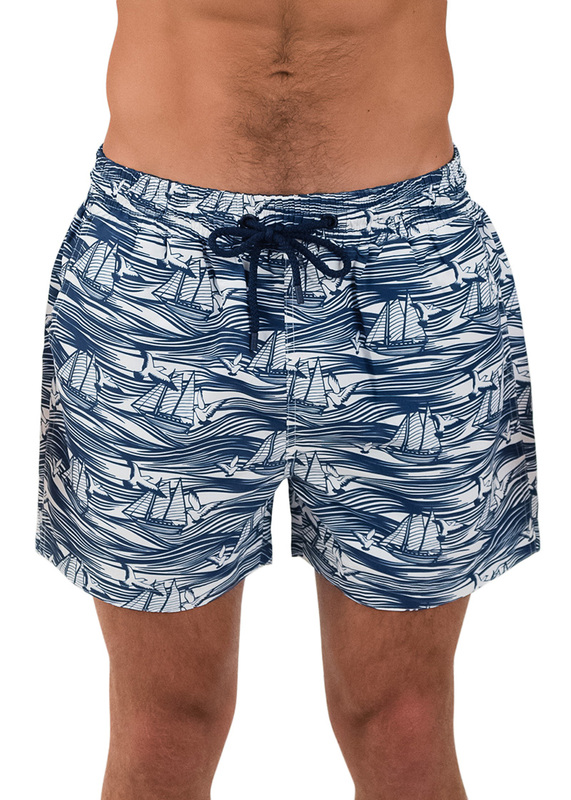 The Rocks Push mens board shorts are packed in a carry bag made from recycled bottles and include a waterproof wallet that slips into the back-zip pocket to keep valuables (keys, money) dry and safe while he gets wet (it’s tested to a depth of 18.2m). Our Balmoral men’s swim shorts are a summer classic and continue to be our most popular style. 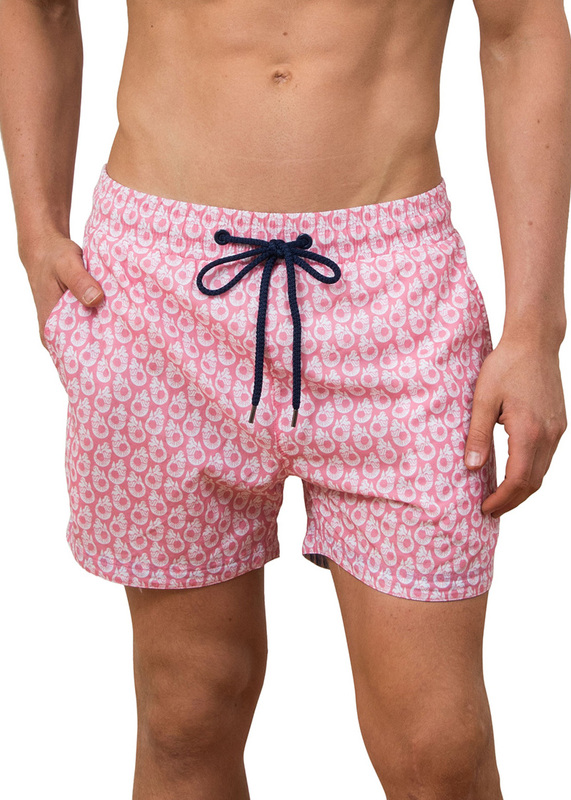 Tailored for comfort and performance, the Balmoral shorts have an elasticated drawstring waistband and a wide leg, making them perfect for swimming, sporting and social. The exclusive mermaid pink print is inspired by a Russian sailors tattoo. The soft light pink with pops of white is fresh and simple. Our shorts feature a waterproof wallet which slips into your back-zip pocket and will keep your phone and keys dry while you get wet, tested to 18.2m. Our shorts come packed in their own carry bag for easy packing. 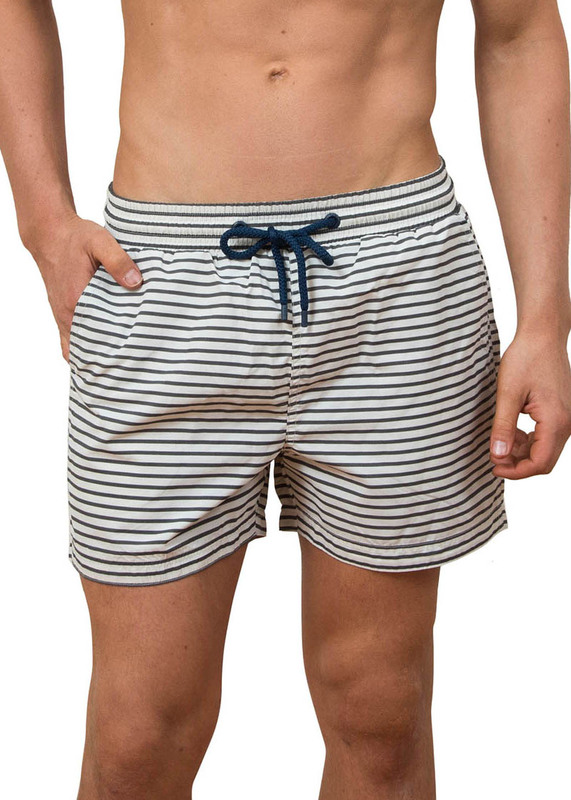 Our mens board shorts are a summer classic and Balmoral is our most popular style. Tailored for comfort and performance, the wide leg fit and elasticated waistband make this style easy to fit most body shapes. 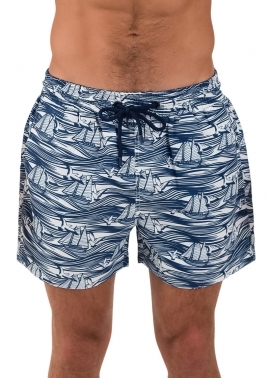 Made from Italian yarn which is recycled drift nets salvaged from our oceans, the fabric is soft, strong and quick drying and the shorts feature a mesh liner for added support. 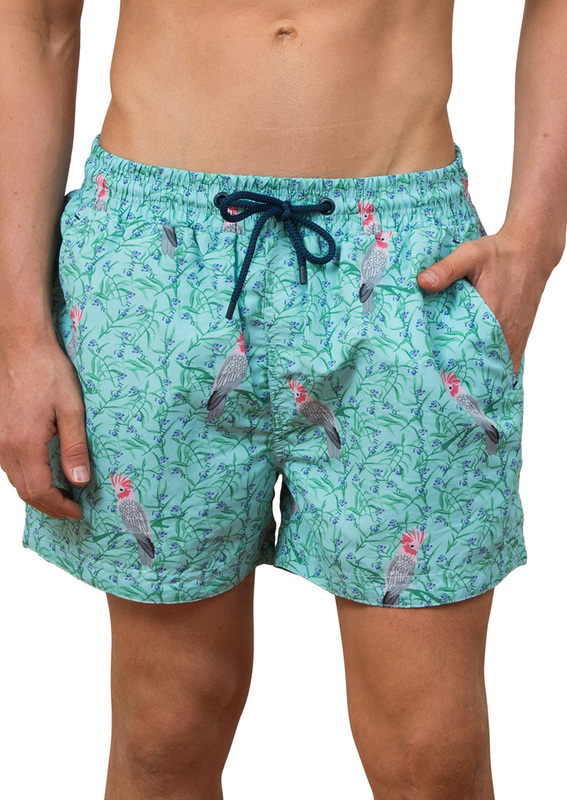 The limited edition tropical aqua print features a cheeky galah sitting amidst jacaranda boughs. The fresh colours will make a statement on the sand or at the bar. Our shorts feature a waterproof wallet which slips into your back-zip pocket and will keep your phone and keys dry while you get wet, tested to 18.2m. 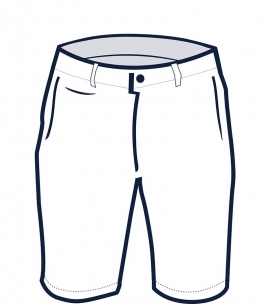 Our shorts come packed in their own carry bag for easy packing.